#832 PA 1987 FC-35 3208 CAT 300HP turbo diesel 70,185 (odometer not working); 379 hours on engine remanufactured in June 2012, 4909 hours on coach, and ZF five speed automatic transmission with retarder. All airbags and brake pads replaced in summer 2013. 12.5 KW Kohler diesel generator has 1545 hours. Four new house batteries and two new engine batteries just installed. EXTERIOR is blue and gray over silver base. Paint is in good condition. Full Zip Dee awning package. INTERIOR has rear bath, twin bed configuration. White laminate cabinetry, Corian counter tops with walnut trim. Living Room features two fabric covered sofas, blue carpet, and 19" TV. KITCHEN has Corian counters with walnut trim, double bowl stainless steel sink, food center, toaster oven, pull-out pantry, gas and electric Dometic refrigerator/freezer and under counter U-Line ice maker. Dinette table is Corian with booth seating, tile flooring. Bath has Corian counter top, three storage closets, shower, and new toilet. Bedroom features twin beds. Other features: auto leveling jacks, 1500 watt inverter, two roof AC's with heat strips, central vacuum system, Firestone 11R 22.5 tires, and two large roof storage compartments. Owner has blue box with manuals and some maintenance records. 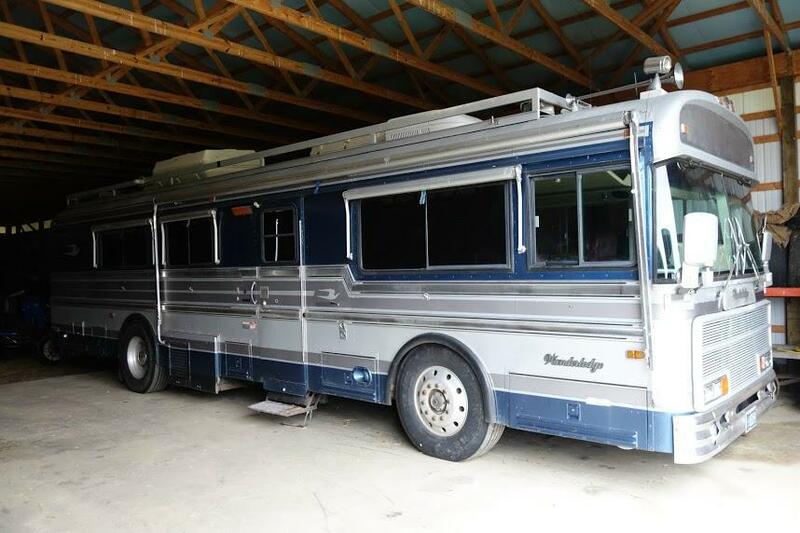 This garaged, non-smoker, no pet coach is in good condition and priced at $27,000.00 or make offer! ADDITIONAL PHOTOS AVAILABLE UPON REQUEST. Mechanically the coach is in excellent condition. Drive it anywhere without any worries. The exterior paint is original and still looks pretty good. Coach was purchased it in 2011. It is stored inside when not in use. This two owner coach was purchased in Florida. It has not been driven in the winter or stored outside. There are a few things not working on the coach: -	Kohler Generator. Engine is good but genset not charging. -	Hydraulic levelers leak fluid -	Pneumatic step won't retract -	Front air conditioning -	Ice maker is disconnected -	Some of the electric heaters don't work. -	Water to shower has been disconnected -	Various 1987 electronics like the backup camera, TV, musical horn The odometer does not work correctly and will hang up at times. Records kept based on the engine hours. Engine gauges work well and operate in the proper range. The air clutch for the cooling fan engages/disengages when it should. The pilot/co-pilot seats have been recovered in maroon nubuck and are in excellent condition. Fridge works well on propane, 12V, and AC. Toilet is new. Stove works well. Curtains, screens, awnings are in good condition. Beds are in good condition. The couches look vintage, but they are in good condition and have no rips, tears, or wear marks. The dinette seats have been recovered in vinyl.